I want to introduce DomesticShelters.org. There is nothing like being in a domestic violence relationship to make one feel isolated and without hope. Domestic Shelters is starting to give women hope in any zip code in North America. A special thank you to the tech guys who made this dream a reality. Shelters can be found in your area with the tap of a button. Additional resources are also included to help women after they leave the shelter. This site is a wonderful resource! 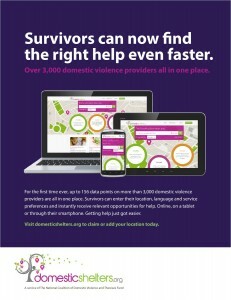 Find Domestic Violence and Abuse Help, Information and Stats The first site and mobile resource with searchable data for domestic shelters in the U.S., plus news and information for those experiencing domestic abuse. Find help, be safe, get smart. We make finding the right shelter and information about domestic violence easier. Instead of searching the Internet, it is all right here. We’ve painstaking verified information on shelters in LA to shelters in NY, and every shelter in between. If you or a friend is suffering from physical abuse, emotional abuse, psychological abuse or verbal abuse, this free service can help. Select domestic violence shelters based on location, service and language needs. Find 24-hour hotlines in your area, service listings, and helpful articles on domestic violence statistics, signs and cycles of abuse, housing services, emergency services, legal and financial services, support groups for women, children and families, and more.